A few weeks ago, my sorority pledge class and I were invited to sleep on the older girls’ dorm. Their dorm has two couches – one sectional and one small couch. Luckily, I called the small couch before anyone else could; however, the rest of the girls weren’t as lucky. I watched as the laid down a base quilt and huddled together with pillows on the floor. I realized then how handy an inflatable mattress would be for their dorm. An air mattress is so practical for college life. Any time you want a friend from out of town to visit, you can always have a place for them to stay. This mattress is Amazon’s number one best seller. 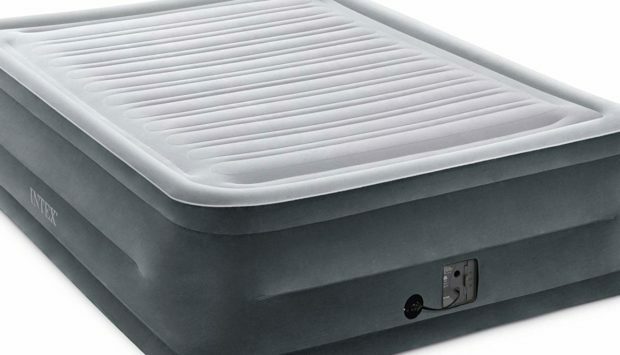 The Intex Comfort Plush Elevated Airbed is a queen and can hold up to 600 lbs. You could definitely squeeze multiple people on there for a sleepover in the dorm. It takes less than 5 minutes to inflate, so you can even keep it deflated until it’s time to go to sleep and keep the dorm room free. This air mattress has indented sides to help keep a sheet on it – so you don’t even need to sleep on just the mattress. It even has a hand carry bag – you could bring it to somewhere you were invited to stay. The best part about this mattress is its sale, though. It’s normally $79.00, but it’s currently on sale for $57.39. You can’t beat that. A comfortable mattress at a reasonable space. It will work for college life. It would even work for camping. I think utilizing this mattress would be considered glamping, but hey, if I’m outdoors, I want to be comfortable. This is definitely a purchase worth investing in. Buy it today!